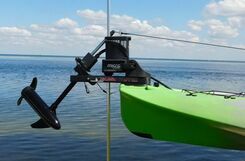 Kayak Trolling Motors, Kayak Transom Mount Motors, Outriggers, Leaning Post, Power Pole Ready Kayak Trolling Motors, and Kayak Accessories. We've designed a simpler, affordable and convenient Kayak Trolling Motor Kit to assist the angling kayaker to make the most of the day. At Island Hopper Outboards, we have a very simple motto: we are here to help you have more fun kayaking, fishing and touring the great outdoors all year round. Top quality you can depend on is just the beginning from kayak trolling motors, kayak motor mounts, kayak leaning post to kayak outriggers and stabilizers. Superior customer service through knowledgeable, credible and authentic expertise is what truly sets Island Hopper Outboards apart. We have a staff of avid kayakers who are experienced people who truly care about the quality of your next outdoor experience. 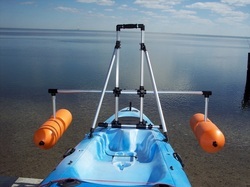 We can motorized most all kayak brands on the market. We want you to be active and adventurous. We want you to explore new places and see new things. Most important, we want you to be comfortable and happy in the outdoor playground we love every bit as much as you do. These trolling motors are exclusively designed with a short shaft and battery indicator. Island Hopper Outboards line of kayak trolling motors are available in Salt Water and Fresh Water, from 32lbs. to 55lbs. of thrust. Another great feature which improves trolling control and saves battery usage is our exclusive Add-A-Rudder system. Island Hopper Outboards is the pioneer in motorizing kayaks. Sit On Top and Sit In kayaks. a.k.a. kayak outriggers and leaning posts. Feel free to cast while standing, see further out than you would sitting in your kayak. The outriggers provide you stability, prevention from tipping over and the ease of standing up to fish. and kayak motor mount accessories.